Justice Thurgood Marshall was sworn in as an associate justice of the Supreme Court of the United States fifty years ago, on October 2, 1967. He was the first African American to hold a seat on the Supreme Court. Justice Marshall had a distinguished legal career and had argued before the Supreme Court many times before he was appointed to the Court. As President Johnson noted, “Marshall is already in the front ranks of the great lawyers of this generation. He has argued 32 cases before the Supreme Court; he has won 29 of them. And that is a batting average of .900.” Marshall was lead counsel in several landmark civil rights cases, among them Shelly v. Kraemer, 334 U.S. 1 (1948), Smith v. Allwright, 321 U.S. 649 (1944), and Brown v. Board of Education of Topeka, 347 U.S. 483 (1954). In University of Maryland v. Murray, 169 Md. 478,182 A. 590 (Md. 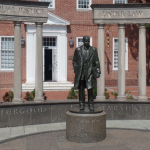 1936), Marshall represented plaintiff Donald G. Murray, who as a result became the first black applicant accepted to the University of Maryland School of Law. Marshall himself had been denied admittance to the University of Maryland Law School on the basis of race. He attended Howard University School of Law. 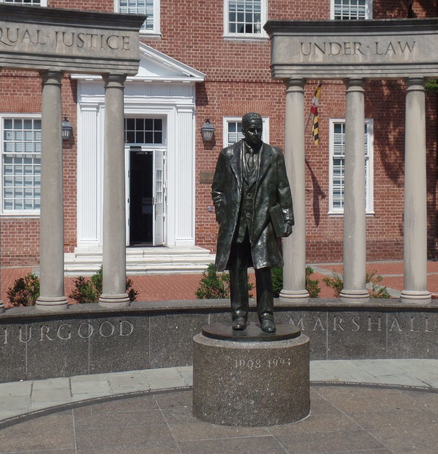 The state later dedicated a memorial to Justice Marshall, engraved with the words “Equal Justice Under Law” on the Lawyer’s Mall in front of the Maryland State House in Annapolis.